Multimodal travel search has arrived and is set to shake up the travel industry: one-stop shopping for all transport modes. Its demand is increasing, but how can the door-to-door travel utopia become a reality? 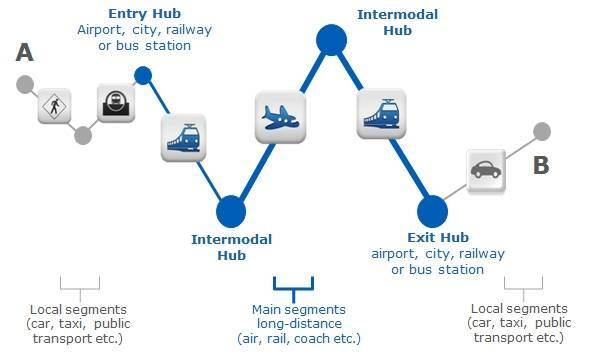 In contrast to many other IT innovations, Europe is pioneering multimodal travel initiatives. Both public and private sectors are keen on supporting such initiatives. A good example is the European Union, financing various projects with the objective of facilitating multimodal travel search and booking. TEN-T, All Ways Travelling, and TAP-TSI are a few examples. A multimodal search engine which can incorporate all these elements will not only be valuable for the traveler but also to companies looking to optimize business travel expenses. At the moment the booking process is focused on the main trip segment, time and its related cost. Additional expenses like a taxi or parking fees are often higher than the main trip segment. And on top, transfer times can extend the total trip duration considerably. A corporate online booking tool which provides total trip cost, trip time and CO² emissions will have huge benefits for companies. Other parameters, like available work time during the trip, and avoiding expensive travel times (travel at night) could provide extra value to reduce overall travel expenses and help move towards real total trip management and a seamless travel experience for the end traveler. If you would like to know more about managing Corporate Travel, download now our whitepaper: Better Business, Smarter Travel.